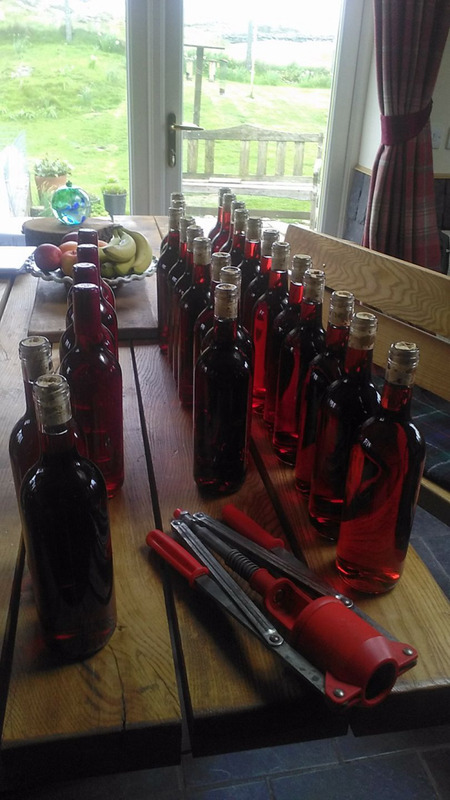 Islay Wines is a small company, run by us,husband and wife team, Kenneth and Helen Carter! Our love of Scottish produce on our doorstep and our love of wine, led to the creation of five unique Islay wines, made and bottled on the small inner Hebridean island of Islay. These fruit wines compliment any meal but are equally delicious on their own. We use fresh produce to really capture the essence of the Scottish flavours of rhubarb and brambles. Open for free tastings from Monday to Saturday, 10am to 6pm, at Dunollie, Mansefield Road, Port Ellen, Islay. We are now closed on Sunday throughout the winter period. These flavours evoke childhood memories of gathering brambles or pulling rhubarb from the garden and dipping in sugar! We also have a hidden gem - usually associated with Islay's world famous whiskies - the humble barley! Our golden grain wine is truly a king amongst wines, well worth a try! Thanks to sporting artist, Rodger McPhail, our new labels depict 3 of his brilliant paintings. We chose beautiful illustrations of woodcock, pheasant and teal for our labels. These wines are totally unique as Rodger has never had his work used for wine labels before - what a wonderful gift for any sporting enthusiast or wine-lover. The bottles can be purchased individually or in a triple gift pack - the choice is yours. Wines available from: The Spar shops in Port Ellen and Bowmore, Bridgend Stores, Bruichladdich's Mini Market and Jura's Community Store.